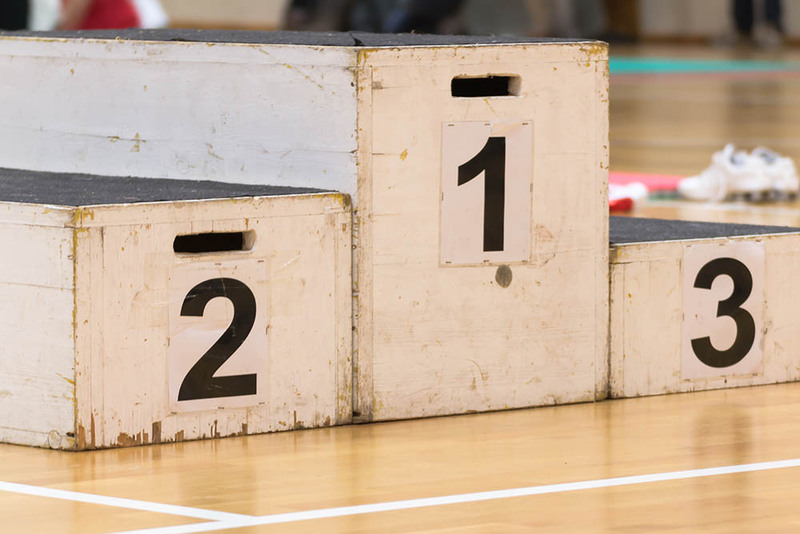 Jumping as high as you can isn’t an Olympic event like the 100-meter sprint and there aren’t any world competitions that pit the world’s best jumpers against each other. As a result there aren’t any official records from sports federations or committees. BUT, we can look to the NFL Combine and NBA draft to get a ballpark figure. After all, these include some of the most talented athletes in the world. This is the most important jump statistic used by the NBA and NFL. If you’re working on developing your own jump, this is what you should be measuring to track progress – you can find out how to do it at home here. In simple terms, it’s where you stand in a spot and reach as high as you can, and compare that figure to your standing reach. Here’s Bryon Jones showing off his 44.5 inch standing vert in the 2015 NFL Combine. He’s considered the best jumper in NFL Combine history, but because of his 147″ broad jump and not his vertical. Surprised? Basketball and dunking is all about those crazy hops, right? Then why are NFL combine participants jumping some 8 inches higher than those from the NBA? Basketball players don’t need to jump that high: The rim is always 10 foot high. With a 33-34 inch standing vert you could dunk from standstill at 6 foot tall. Most dunks have a runup, which means you jump higher anyway. Finally, very tall players (plenty in the NBA) don’t stand to gain as much from a incredible jump. Football players train for explosiveness. Basketball players endure 4 quarters of 12-minute, intense play, so they need to train for endurance. By contrast, the focus for football players is on bursts of explosive activity. ‘Explosive’ statistics like the 40-yard dash, 20-yard shuttle and vert jump are therefore crucial for a NFL player. Training programs like Vert Shock are designed to maximize a player’s vertical by training the fast-twitch muscle fibers. While the standing jump is a measure of pure explosiveness, a running jump is more important during an actual basketball or football game. A running jump involves a run up before the jump, which will add energy to produce an even greater leap. The better your running jump technique, the more energy you can add to your jump during the approach. The NFL Combine does not measure the running vert. It’s safe to bet they’d be a lot more impressive than the NBA draft, since their highest standing leap is better than the NBA draft’s highest running leap! Note that the ‘run up’ is limited to a few steps. The players can jump even higher if they are performing a half-court run up like the crazy dunks you see on TV. The technique of a runup makes a big difference to how you gain from it. When we look at the NBA combine we find a player’s running vert is typically between 4-9 inches higher than their standing vert. Given the best NFL players has a standing vertical of 46″, 50-54″ is within the realms of possibility. In this jump the person has to jump onto a platform from a standing position. The goal here isn’t to get your hand as high up in the air as possible, but maximize the distance between the surface and your feet. The reason this figure will always be higher than any standing or running vertical jump is because you tuck your legs in during the jump. In 2016, Evan Ungar from Canada set the highest vertical jump Guinness World Record at 63.5 inches. The previous Guinness world record of 60 inches was held by Justin Bethel. The explosiveness here is incredible, and it’d be interesting to see how these guys fare in standing and running leaps. Kadour Ziani is a 5’11 Slam Nation dunker who many people believe has the highest jump in the world at 60 inches. However, this has not been officially verified, so it’s fairer to give Evan Ungar the ‘official’ record and Kevin Bania the ‘unofficial’ record at 65″. There are 3 types of vertical jump which are typically tested: Standing, Running and Platform. It’s difficult to identify the world record holder for standing and running as there is no official competition like the Olympics where athletes compete in this activity. Contrary to popular belief, NBA players aren’t the best in the business. In fact, NFL players can leap much higher than them due to the explosive nature of their training. Lets not get too concerned about who holds what record. From all the data out there, we can get a rough idea of what is humanly possible. Standing Vertical: NFL players are among the most genetically gifted people on earth, but they don’t train exclusively for their vertical leap. So a standing vert of 47-48″ is not completely unrealistic. 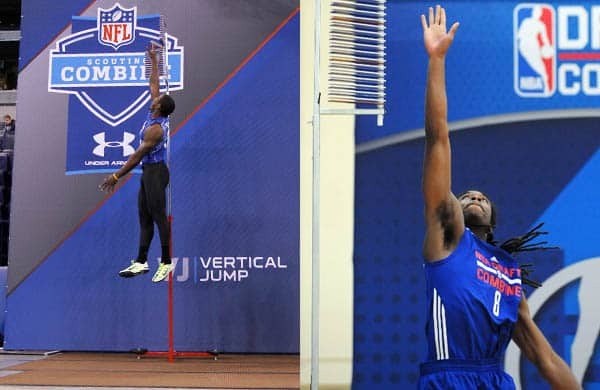 Running Vertical: When we look at the NBA combine we find a player’s running vert is anywhere between 4-9 inches higher than their standing vert. Given the best NFL players have a standing vertical of 45-46″, I can easily see them getting around 50-52″ with a run up. Platform Jump: We’ve seen people do 60-65″ and these people are pretty serious about jumping, so that is very close to the theoretical limit. Obviously, us mere mortals are probably never going to see such heights. However, it’s completely unnecessary. I have a comparatively pathetic running vertical of 34″ and it doesn’t stop me from dunking at 6-foot! This was a well put together article. The only thing I will add is that I don’t think that you would see a whole lot of change from standing to running vertical with the NFL players. In fact, I think some might even have higher standing verts than running verts. Just a matter of technique with some people. I wish they added the approach vertical to the NFL combine so we can see everyone’s true max vert. You raise a great point Mike. Since NFL players are actively looking to improve their Combine results they would spend more time perfecting its technique. Their actual run-up technique therefore might be less refined. However, with some practice, their running jump SHOULD be higher than their standing. This is just a simple consequence of being able to take advantage of the momentum from the run up. I don’t think this is quite right. It’s not just a matter of training. It’s also the pools of athletes each sport draws from. Basketball puts such a high premiums on height, standing reach, and skills that the vast majority of the world’s population is ruled out of NBA combine competition on height and arm length alone. Many more are excluded on shooting and ball handling deficiencies. Anyone under 6’3″ is pretty much only considered as a point guard. About 4% of people are 6’3″ or more. Also consider that there are about 60 NBA combine participants annually (63 in 2016) vs 330 NFL participants. The size and specialization of NFL teams mean they can find positions for super explosive athletes with no other skills or assets and they get combine invites, whereas in the NBA, you gotta have enough other stuff going for you to get any interest. It’s not like NBA prospects don’t train for explosiveness and if they just trained a little more they’d be as explosive. It’s that a whole lot of really high jumpers can’t shoot, dribble, or are too short to play basketball, so they go play defensive back in the college where if you can run and jump, you can play. That’s a great point Ken. The NFL certainly does draw from a bigger pool of athletes without as many height, standing reach and other constraints that makes the NBA especially difficult to get into. However, I think it is clear from the substantial void between historical NFL and NBA athletes’ vertical jump scores that the training does play a major role. The physical demands of a football game and a basketball game are very different – NFL players need to focus on developing a level of explosiveness that wouldn’t be advantageous in a 4-quarter NBA game and the results reflect that. It would be very different in an actual game. Football players wear a lot of heavy protective gear that would substantially reduce their jump height. Furthermore they run on grass that absorbs some of their running and jumping energy. On the contrary, basketball players wear only jersey, shorts; The clothes have negligible impact on jumping. While basketball shoes improve traction on hardwood floor for solid jumps. They claim Michael Jordan as highest basketball NBA leaper at 48″. I infer their technique to determine the height is to pause and slow replay the game footage. Measure the apex height of the player’s head relative to the rim (which stands at 10′) while in the air, and the difference to the player’s official height. Very well done article! I enjoyed reading it as a track and field coach and former basketball player. I have never measured my running vertical jump, but in my younger years measured a 28.5″ standing vert while injured and in the middle of cross country training. These are great jumps!The standing jumps unto platforms are not accurate measures of of someones vertical leap. It should be how high they can get the top of their head off the ground minus their height, without assistance of a platform.